If you're shopping for Vacuum Sealer Bags our Vacuum Sealer Bag Buying Guide can help you out, we can tell you the key things to keep in mind to make sure you purchase the item that best suits your needs. You may also find our Vacuum Sealer Bags Frequently Asked Questions or How to Choose Vacuum Sealer Bags pages helpful. The most important factor to keep in mind is making sure you choose Vacuum Sealer Bags that are compatible with your Vacuum Sealer. Manufacturers design their machines to operate at slightly different temperatures, so not all brands bags will work in all machines. One way is to make sure you always buy bags from the same brand as your vacuum sealer machine, however this isn't always the most economical choice. If you're looking to get bags that are compatible with your vacuum sealer, without spending more than you need to, look at Generic Vacuum Sealer Bags also known as Universal Vacuum Sealer Bags. Universal Vacuum Sealer Bags are designed to be compatible with most vacuum sealer models: OutOfAir, FoodVacBags, Avid Armor, FoodSaver, CaseKix, Nutri-Lock, and Simple Houseware. 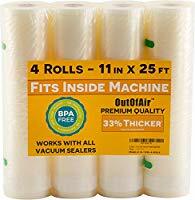 Our top rated Vacuum Sealer Bag Roll OutOfAir 11"x25ft Vacuum Sealer Bag Roll (4 Rolls) costs $0.29 per square foot, compared to FoodSaver Bags which costs $0.64 per square foot. Choosing a generic brand can save you a lot of money especially over years of use. The next factor to keep in mind is thickness of the Vacuum Sealer Bags. Thickness is measured in Mil, 1 Mil is 1/1000th of an inch, this should not be confused with millimeters. For short term storage (less than 30 days) or for Sous Vide use, the standard thickness or 9 Mil - 10 Mil is perfectly fine. If you plan on storing your food for longer periods of time, or you're storing game meat with bones, you're going to want something thicker. FoodSaver Bags have a thickness of 11.5 Mil and CaseKix Bags are 12 Mil, they are great for long term storage, but aren't very economical for everyday use. Next you want to consider Pre-Cut Vacuum Sealer Bags vs Vacuum Sealer Bag Rolls. 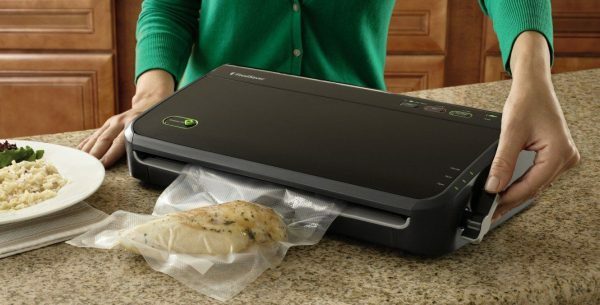 If your vacuum sealer has on-board bag roll storage, the smartest choice is to use rolls. Rolls are always cheaper than pre-cut bags, they aren't a lot cheaper, but they are cheaper. Secondly because you can custom cut your bags to the size of your food, you're going to reduce the amount of waste you have. Less waste means more cost savings, especially over years of use. If you don't have on-board roll storage, using pre-cut bags is usually a better choice, just because of the convenience factor. It's a lot easier to go grab a bag out of the box, as opposed to getting the roll, measuring out the bag size, and then finding the scissors. One last thing to keep in mind about rolls is the size, most rolls are less than 25ft in length, but some rolls are 50ft, which makes them larger in a diameter than other rolls, make sure your machine can accommodate bag rolls that size.